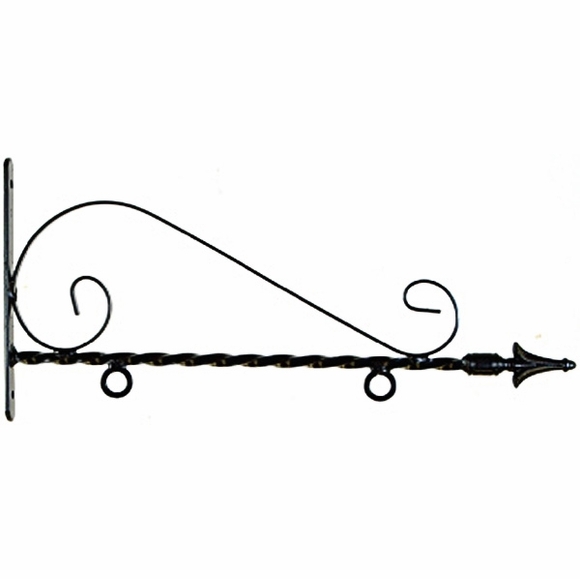 Stone Mill Wrought Iron Bracket for Hanging Sign - - 12" x 16", 14" x 18", 12" x 19", or 16" x 20" one-sided or two-sided hanging address plaques. The bracket for 12" x 16" and 14" x 18" signs is approximately 21.5" long. Ring centers are 10" apart (+ or - 0.5"). The bracket for the 16" x 20" and 12" x 19" signs is approximately 27.5" long. Ring centers are 14" apart (+ or - 0.5"). Mount on post or tree, using the included hooks (shown in Sunset Farm sign in the small image above) or your own hooks to attach your sign. Strong enough to hold 18 lb sign. Reasonable price. The bracket is perfect. We attached it to a tree to hang our sign and it appears to be well made and substantial.